Here is yet another of my favorite, easy to prepare and inexpensive chicken recipes. We have recently been buying chicken thighs in bulk which I’ve found are both inexpensive and quite flavorful. One of my favorite ways to prepare thighs lately is to brown them, and then cook them in sauce in a moderate oven in a sauce for a couple of hours. The meat is extremely tender and you can change up the sauce however you prefer every time you make this dish. You can add mushrooms or olives which changes the flavor completely. This dish came about when I needed to use up some red peppers in my refrigerator and was craving something comforting. I added tomatoes, onions, garlic, capers and seasonings and ended up with a delicious “pepper cacciatore” type of dish. To limit your starchy carbs try serving this chicken dish on top of cauliflower puree, although mashed potatoes or whole grain polenta would be great too. This dish would also be great cooked in the slow cooker. Poultry, both white and dark meat, is a great source of low fat protein and both the skin and any fat are removed from the chicken before cooking. Tomatoes are rich in Lycopene, vitamin C, potassium, iron, and fiber. 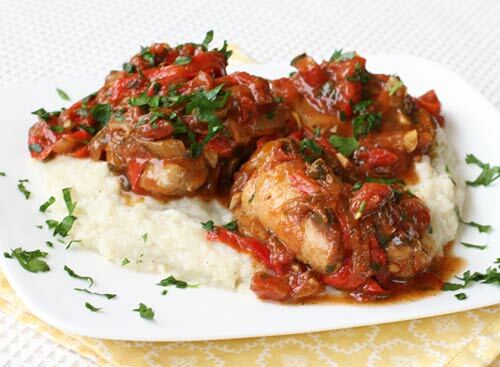 A comforting cacciatore type of chicken dish that could easily be prepared in a slow cooker. In a large ovenproof pan or dutch oven, heat the olive oil and then brown the chicken thighs well on all sides. Remove the chicken to a plate and then add the onions and peppers to the pan and cook on medium heat until softened. Add the garlic and cook another 2 minutes. Add the chicken back into the pan along with the wine. Increase the heat, and cook until the wine has reduced by at least half. Add the tomatoes, parsley, oregano, chili flakes, capers, salt and pepper and mix well. Cover the pan and bake for 2 hours, removing the cover during the last 30 minutes to thicken the sauce. Serve hot over pureed cauliflower as shown, or whole grain polenta.